Common Juniper. Juniperus communis L.
The juniper occurs on dry, sterile hills from Canada south to New Jersey, west to Nebraska, and in the Rocky Mountains to New Mexico. Juniper is an evergreen shrub sometimes attaining the height of a small tree, with erect trunk and spreading branches, covered with a shreddy bark. The leaves are straight and rigid, awl-shaped, about one-fourth to one-half an inch long, with sharp, prickly points. The male and female flowers produced in April and May are usually borne on separate plants, the male flowers in short catkins and the female flowers in short cones. The fleshy, berrylike fruit, which does not ripen until the second year, is roundish, dark purple, covered with a pale-bluish bloom and contains three bony seeds embedded in a brownish pulp. It has a spicy, aromatic odor and a bitterish, turpentinelike taste. The berries, for which there is only a limited demand, are collected when ripe, usually in October. 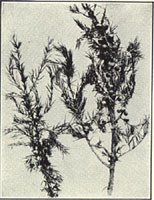 Oil of juniper is obtained from the berries by distillation. prev: Comfrey. Symphytum officinale L.
next: Common Winterberry. Ilex verticillata (L.) A. Gray.